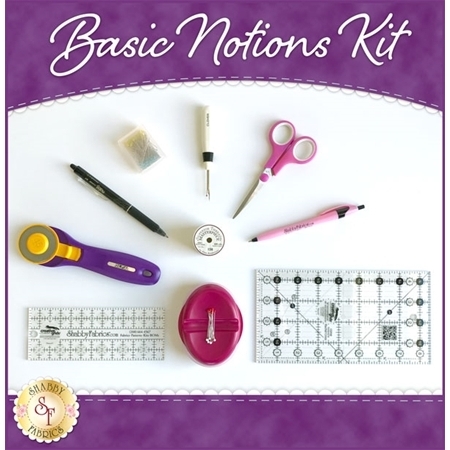 Whether you are new to quilting, or you are giving the gift of quilting to a daughter, granddaughter, coworker or friend, this Basic Notions Kit is the perfect first step! This kit was put together piece-by-piece with the new quilter in mind, and is the ideal companion to the Shabby Fabrics Learn To Quilt Series - Beginner Quilt Kit. By purchasing these notions as a kit instead of individually, you're saving $15.00! This kit contains the majority of what you need to create your first quilt. A 24" x 36" Cutting Mat and 6" x 24" Ruler is essential and will need to be purchased separately. These two notions can be found at your local quilt shop, JoAnns, Wal-Mart, and Hobby Lobby. Along with this great Beginner Kit, Shabby Fabrics has an 8-part video tutorial series where Jennifer walks you step-by-step through the process of creating your first quilt!